The world knows her as Semiramis, Semiramide, Sammu-Rammat, Samira, Shamiram. To us, the Assyrians, she is simply Shamiram. Numerous operas are based on this mythical Assyrian, including Semiramide by Domenico Cimarosa, Marcos Portugal, and, the most famous, Gioacchino Rossini. Now enter the cantata Ninos and Shamiram by the French composer Michel Bosc and the Assyrian poet Yosip Bet Yosip. The cantata is among the highlights in this year’s Mesopotamian Night, a gala production of Assyrian classical and popular music with dance, on August 21, at the Gallo Center for the Arts in Modesto, California. In its fourth year, the Mesopotamian Night series is presented by the Assyrian Aid Society of America (AAS-A) not only to showcase the Assyrian classical and popular performing arts but also to raise funds through tickets and its art auction for needy Iraqi Assyrians. Many myths and legends surround the beautiful and shrewd Babylonian princess who became the Assyrian queen. According to one legend, a shepherd found Shamiram, born in the desert and reared by doves. Some historical accounts of her later life note Shamiram married King Shamsi-Adad V (or VII), and after his death, she ruled for a short time, until Adad-nirari III (or IV) ascended the Assyrian throne. Shamiram appears as queen and goddess in some Assyrian mythological accounts of her life, and that she was the daughter of the fish goddess. Not only was she the founder of Babylon, Shamiram also gets the dubious credit for inventing the chastity belt, and also for being the first to turn young boys into eunuchs by castrating them. 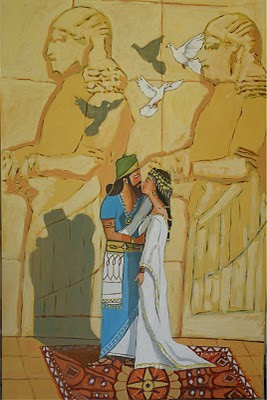 According one legend, she married King Ninos, who founded Nineveh, and after his death, ruled for many years. Her end came at the hands of her son. Finally, the beautiful Shamiram turned into dove and flew away. Somewhere between myth and reality lies the truth about Shamiram’s life. Either way, this remarkable and colorful Assyrian legend continues as an ideal subject for literary and operatic works. Rabi Yosip’s song-poem, Ninos and Shamiram is one such example, set to Bosc’s musical score. Rabi Yosip’s Ninos and Shamiram had its origin in an Assyrian song-poem he had heard in his teens in Tehran. Sung by a friend named Nimrod, from a mountain village in Urmia, the story was part of the Assyrian oral tradition, passed on from one generation to the next. It told of an encounter in a lush valley in the mountains between a hunter and a shepherdess. In the following years, as he matured in age and his knowledge of Assyrian history grew, he revised and expanded the poem into a more literary work. He also made some changes in the melody. By then he had heard many myths about the legendary King Ninos, who had met a shepherdess in the dessert named Shamiram and made her his queen. Elements from all the stories, myths and legends about Ninos and Shamiram found their way in various forms into Rabi Yosip’s new version. 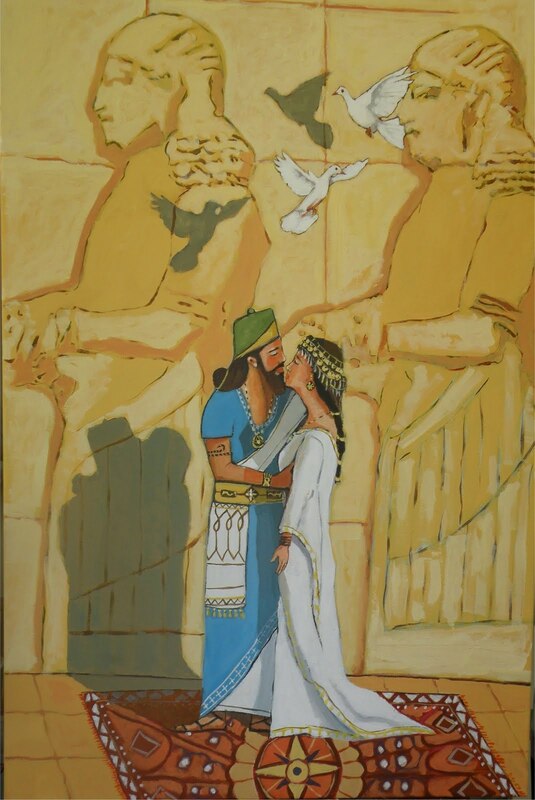 Finally he titled his song-poem Ninos and Shamiram, transposing the characters of King Ninos and Queen Shamiram into a young prince named Ninos and a beautiful shepherdess named Shamiram, who steals his heart and compels him to ask she go with him home to Nineveh. Rabi Yosip’s poetry soars with imagination, weaving myth and legend with historical data. Most of all, the words are those of an Assyrian poet whose love of his nation sparkles with the romantic imagery in the song-poem Ninos and Shamiram. Michel Bosc had already worked on previous year’s Mesopotamian Night production. One act from his opera Qateeni Gabbara was presented at the 2009 gala performance. Based on William Daniel’s Assyrian Epic, Qateeni Gabbara is still a work in progress. Also for the 2009 production, Bosc had orchestrated solo piano works by the Assyrian composer Paulus Khofri into a suite titled Assyryt. The first part was presented in the 2009 concert as Assyryt Suite No. 1. Assyryt Suite No. 2 is in the lineup for this year’s program. Ninos and Shamiram is written as a cantata for soprano and tenor with orchestra. The cantata, from the Italian word cantare, meaning “to sing,” was a relatively large 17th-century secular work in operatic style for one or two singers with accompaniment. It continued to evolve into a more elaborate work that included secular and religious texts. Johann Sebastian Bach transformed the cantata to include soloists, chorus and orchestra, producing some 200 church cantatas. Since the late 18th century, the cantata has further evolved into a choral religious or secular work with orchestra and with or without soloists.